For our very first episode, we had a conversation with EQ Bank’s CEO, Andrew Moor. He shared his vision of what customer-centric open banking could shape up to be — and it has something in common with spring cleaning. Open banking is not just about new technologies, it’s also how different business models adapt or react to these new technologies. One of Andrew’s goals is to translate EQ Bank’s customer-centric approach of making people’s lives better in a world where data is easily and securely shared between financial institutions and fintechs. By collaborating with third-party providers, they can focus on a selection of high-quality products, while still allowing their customers to access a wide range of financial services. A customer-centric mindset means recognizing that financial data belongs to consumers, and enabling them to make it work to their own benefit. Data security is a real concern, but bankers shouldn’t use this as an excuse to avoid making it convenient for their customers to deal with more than one financial institution. Great user experience, covering everything from onboarding to troubleshooting problems, will be a key to succeed as consumers start to shop around. According to Andrew, Canadian financial institutions can learn from companies like Uber and Amazon that really work to understand their customers’ need. Simplicity and convenience are concepts that get thrown around when experts talk about open banking. Andrew would like to see open banking move beyond data sharing, to really enable customers to manage all their financial affairs from a single spot and get personalized hints about financial products tailored to their needs. Coupled with open banking, automation will become a great tool for consumers to manage some of their financial affairs. It’ll free up time and resources so they can do what they really like. For instance, they should be able to set up their accounts so if money builds up in a checking account it’s automatically transferred to a savings account, or they should get the best mortgage provider for them without having to file multiple applications. Adam: Today is a discussion with Andrew Moor. He’s the CEO of EQ bank, which is a Canadian challenger bank. What we were hoping to get out of today is to learn a little bit about you, learn about your view of building a challenger financial institution within Canada. 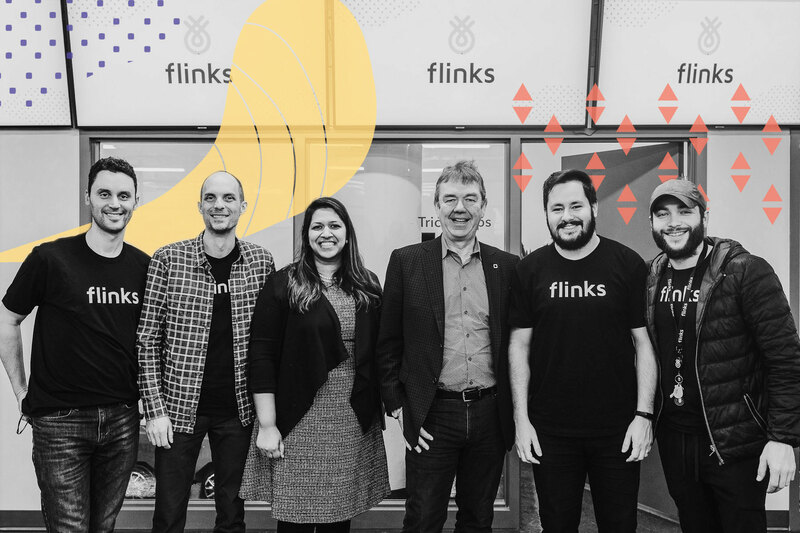 And specifically, tackling the idea of open banking which is something that we at Flinks are really passionate about. And I know you guys have been pretty vocal as well. One of the things that I thought might be interesting to kick it off is just if you can tell us about EQ and where you guys fit within the system. Andrew: Equitable Bank or EQ Bank is a direct-to-consumer brand. It is actually Canada’s 9th largest bank. Not many people know that. We’re obviously much smaller than the large big six financial institutions. Nonetheless, we have about 25 billion in assets and we’re listed on the Toronto Stock Exchange. We’re a small company but we have some significant resources to be able to provide a competitive attention and great solutions to Canadian customers. Our mission very much as a challenger bank is to find ways that we can enrich our customers’ lives and make things better for them. And, you know, we think we’re on that journey in a few areas, for sure. Adam: What do you think has been key to letting you guys grow throughout the years? Andrew: We’ve always had ‘service’ as a mantra. So, even if you just look at our annual reports from 10 years ago, you’ll see that we were always very keen on service. Ten years ago, a lot of that was driven by people responding to the phone calls quickly. But technology is really changing the world in that regard. We continue to want to have people that respond very quickly to customer requests but really link that up with some great technology, to make people’s lives easier, and reduce the friction that’s inherent in the banking system. Adam: And is that something that comes through when you’re looking at finding people to actually build out your business? Andrew: Yeah, one of the things we’re looking for is people who actually care about service. When you leave the bank at the end the day you want to feel that you made your customers lives better with the service you’re providing. There’s an inherent reward in doing that. And if you can make money while you’re doing it, that’s just great. But unless you’re actually making people’s lives better, you know, why bother showing up for work? Adam: That’s an interesting role of actually focusing on making people’s lives better. What are some concrete examples of how you think EQ helps improve the lives of your customers? Andrew: Well, I think EQ Savings Plus Account is innovative in the Canadian market. Essentially we’re seeing it as a hub account. You don’t really have to worry about your money. It’s always going to get a great interest rate. All of our customers whether you’ve got $1 in there or $100,000 gets 2.3%. If you joined as a new customer yesterday, or whether you’ve been with us for a couple of years, you’ll get the same rate. And then we try to link that up in ways that make it easy to move your money to other institutions or where you actually want to spend it. You think about the core purpose of banking it really is to hold that money safely, move it easily when you want it, and provide an interest rate on it. If you reduce banking down to its core values, those are the three things we try to focus on. And the Savings Plus Account brings that forward in a way that is unique in the ecosystem today. Adam: One of the people that I really look up to is Peter Thiel. He’s one of the founders of PayPal, a legendary tech investor, the first guy into Facebook. He’s got a great question that he asks people to find their contrarian point of view — what that person believes as a really core fundamental truth that’s different than how other people view it. In the EQ Bank context, what do you guys believe is a real core truth about how consumers deal with money or how that relationship should be with their banks, that’s different than how other institutions see it? Andrew: We’re realistic that we can only be really great at a few products. And we think that consumers should actually shop for banking services and start to segment it much as they do with their retailer. You don’t go into a department store to buy great coffee, you go to a specialty coffee roaster. And I think that’s the way that financial services need to evolve. And you see lots of the innovation that’s really providing value in life like ETFs were not pioneered by the big financial conglomerates. They get pioneered by smaller outfits and then adopted when it’s clear that the value is there. Same with the robo-advisors — we are very close with the folks at Wealthsimple. To me, that seems like a great solution for people trying to invest in the equity markets for the first time. These innovations are not things you’d likely to get offered if you just walk into a bank branch and describe your needs. I think that is distinctive from at least the big six banks in Canada would claim they can offer you every financial service need from the time you first got out of school to the time that you die. Adam: When you look beyond the financial sector, is there any companies that you think are doing a really, really good job of delivering value to consumers in a different way? Andrew: Uber’s obviously the classic example. I’ve now got a record of where I went and where I’m going to and then when I expense that, nobody can dispute that it was on business. There was a book on digital banking that I wanted to order from Amazon, it arrived on my desk the following morning. At most five guys in the entire country wanna read this book and yet I was able to get it within 24 hours. Compared to the old days going into a bookstore and trying to find that book and it’s not even there, I mean, clearly, this technology is just changing the world for all of us. Adam: How do you think either the established big five banks or a challenger bank like EQ should actually take that back into how they manage their core business? For example, we don’t know the gender of our customers. And the reason why we don’t know the gender of our customers is that we actually don’t need it as part of an onboarding process, right? And so just to make that one click, to make that onboarding that much easier rather looking for information from you so that we can then market other things to you. It’s trying to make it easy as possible from the customers perspective. Andrew: Well, there are lots of ways. With the call centers, interviewing customers, things like ratings on the App Store. It is interesting, though, in our traditional business where we’re dealing with mortgage brokers, it’s much easier to go and talk to them. You’re in a B2B, in constant relationship with them. When you’re dealing with consumers, you’re dealing with, you know, many thousands of consumers, dealing with your app, interfacing with you, it’s very clear that you could be missing something about their real experience compared to what we think we’re trying to deliver. So, I can’t say that we necessarily solved for that yet, but we’re working on it. Adam: Interesting. How do you get feedback from your customers on their product or something else? Andrew: Our general thesis is everything should be so self-evident that you don’t actually have to need to call us — ie, the use cases should be easy enough that it’s self-evident from the app. But we do also get good feedback when people do come in either by chat or telephone into the call center. And our general view about that as well is unlike other banks: we try to really solve the problem so we don’t measure how long the phone call is. What we’re really interested in is this: did we actually solve the issue and satisfy the customer when they get off the phone? It’s a slightly different way of thinking about call centers. We try to pick up the phone within a few rings. Sometimes I call my credit card company at 10:00 at night, and strangely, there’s a surge in demand for credit card calls at 10. It just seems impossible to me — they’ve basically understaffed that call center. We certainly try to turn the world a bit on its head that way. It shouldn’t take 15 minutes to get hold of the credit card company. Adam: Yeah. Wouldn’t that be nice? Adam: The big hairy topic that I wanted to jump into is this idea of open banking, which is something that we as a company care really deeply about. And a lot of people talk about it. But what I think might be interesting is just to set the stage. How would you explain to a typical EQ Bank customer, like a regular person, what is open banking and why it actually matters to them? Andrew: Well, open banking can have many variations but in the simplest form, you’re gonna be able to see all your financial affairs in one spot. I think most of us could relate to the fact that today if you had an account at one bank and another account, you’d have to open up both those things, jot down on a piece of paper what the balance is where and try figure that out. In the future, in an open banking environment, you should be able to see all of your statements in one place. So, how much you owe on your credit cards, how much cash you’ve got in the various banks, what your mortgage balance is. So, you can actually think about your entire financial life even if you’ve got different providers. Now, a second iteration of open banking could be that you actually can move money between banks from one single log on spot. You come into one bank or to another financial services provider and move money between, let’s say the Royal Bank and EQ Bank from that application. That’s an interesting evolution about how you could think about being able to manage financial affairs for the best benefit for you. Adam: One of the things that I’ve heard you say a couple of times before in some interviews is that EQ Back is really well positioned in a world for open banking. What does it mean for a bank, in general, to be well positioned in an open banking world? Andrew: Well, one of the key building pieces of open banking is to have APIs that can talk to other institutions and other service providers. The way we think about that is that our core banking system has a layer on top of it so we can easily build APIs to the outside world. That’s a fundamental building block of open banking. Also, all of our technology all sit in the cloud, so it’s easily scalable as well as we go forward. I think that’s gonna be different than some of the larger institutions that still have stuff sitting on mainframes that they’ve got to pull up and extract data out of. So, it’s more a question of IT architecture more than anything else. It gets a bit nerdy to talk about it. But we should be in a place where we can build APIs more quickly and cheaper than other people. Adam: What do you think is the blocker to get you from where we are today and that vision of where you guys wanna get in the future? Is it a technological challenge, a regulatory challenge, a consumer adoption challenge? Andrew: Well, I think it’s all of the above. There are serious potential issues about cybersecurity and instability of the financial system. This will have a lot of push from the regulators. The other thing about Canada is that we have a very concentrated banking system. Not everybody has the same interest in opening up the customer data to other third-party providers. And then we need an entrepreneurial ecosystem that supports that. Companies like Flinks that can support the open banking agenda are gonna be important parts of thinking about the possibilities that emerge. The great thing about open banking is you can’t even think what that future looks like. Ten years from now it could be completely different than what we have envisioned but it’s a catalyst to all kinds of other interesting services for other people. Adam: You said the open banking agenda. Whose agenda is it? Andrew: Well, it’s certainly the government’s agenda. Bill Morneau, the Minister of Finance, actually raised it at the budget of February of this year. An expert panel has been appointed and the Ministry of Finance put out a paper on it. So it’s in the center of that agenda. I think it should be in the middle of any agenda of anybody that is pro-consumer, frankly. The consumer lobbies should be thinking about this. There are lots of other examples around the world, and Canada is actually a little bit behind compared to Europe and Australia. It’s a global force, it’s happening in any event to some degree. But to formalize that at a government level and create appropriate regulation is gonna be critical to success in Canada going forward. Adam: Are there any financial institutions that you look to in those more mature markets, as it relates to open banking, that you think have started to tackle this really, really well? Andrew: Certainly people that seem to have the right ideas, that excite me around having the right ideas, there’s Sterling Bank in the UK would be one that’s almost built itself as a technology shop that has to do a bit banking on the side. They really seem to be good at building those apps and for the onboarding process. The UK is a very interesting example, many banks right now are trying to do different things. Like what I see with Loot, for example. It’s not actually necessarily a great example of open banking, but it’s how an ecosystem can become more vibrant. This is a bank that focuses on students and it’s an interesting niche play. Adam: And is that how you’d imagine the Canadian market to adopt open bank accounts, with more of these niche providers that are really focused on one or two products? Andrew: Well, certainly there’s gonna be a place for them and there’s gonna be a place for other more generally. The idea that you have all your financial products with one bank, which many people still do, will certainly start to break down. You start to think of one of the big six being excellent for, let’s say international remittances. One might be, great for good high-value savings accounts. You might get another one for your credit card because it’s got better loyalty points associated with it. We’ve seen some of that over the last few years but it’s still actually pretty inconvenient to deal with more than one financial institution. Most banks are really trying to put their arms around you and answer all of your need. I think we’ll see that start to become less effective as consumers start making their own selections. Adam: Do you think this is something that consumers need to take more of an active approach into either advocating for something like this or becoming aware that it’s available? Andrew: I think consumers will change as it becomes easier. I mean, it’s for consumers to live their own life. As for us as the company is trying to provide services to consumers to wave the flag and explain why our products and our approach is better than perhaps what they’re getting today. But I don’t think there’s much obligation on the consumer. Different people have different needs and I think most people don’t want to spend too much time banking frankly. I think it’ll be one of those things like spring cleaning: you do it infrequently. But you can set it up and your financial affairs will be fairly well sorted. Things like if too much money built up in a checking account, it would automatically move to a savings account; making sure you’re paying off credit cards on time so you’re not paying interest; making sure your mortgage rates are at an appropriate rate. You know, these are boring things to manage. Adam: But they’re critical, right? It’s stuff that compounds that actually creates wealth. Andrew: A sensible person just managing their affairs and their own course should be able to do that without really having to disrupt their whole lives. I think open banking is gonna help that. You should have some reasonably trusted shopping services helping you make sure that you’re selecting the right products and managing your financial life in the right way. Adam: Outside of managing your financial life, what about actually being able to manage your data about your financial life? This is something you’re seeing coming under fire in the States, especially with the data that advertisers or big tech companies have about consumers. And there’s a push for consumers to build take back control over that data. You’ve been quoted a couple of times saying that you believe that consumers own their own data in the financial world. How do you imagine a system where consumers can actually manage who has access to that data in the future? Andrew: It’s gonna be a critical part of the open banking agenda. I think you do start with that fundamental principle, as you first laid out there. It’s your data. I mean, you did the transactions, it’s your story of your financial life that belongs to you. And you should be able to share it with people that you want to share it with, you should have access to it. And, frankly, the big tech companies, we’re gonna see a fair bit of pushback over the next four or five years about how they’ve actually abused customer data. I think we will be less comfortable with the way it’s been over the last two or three years where it’s been a bit of the Wild West and then data is being used in ways that we probably are feeling uncomfortable about and there’s no governance around that. So we’ll see a bit of pushback against those guys. Meanwhile, I think as bankers we tend to be highly secretive around data. So, part of it’s coming from a really good place to try to keep people’s data really secure. And really, it’s our customers’ data. And we need to allow them to use it in ways that make sense for them. Andrew: There are all sorts of insights they have about the customers they should be able to wow them with. There are all kinds of things going on where I would like hints from my financial institution about things going on in my financial life that I don’t get. Partly that could be because I’m dealing with other FIs that they seem completely oblivious to. So, occasionally I’ll get an inbound call offering me some kind of product that is actually completely inappropriate for me because they don’t understand some other facet of my financial life with another FI. So, you know, hopefully, they can provide a consolidated view of that. You’ve applied some intelligence to people in a much as when I go to Amazon and I buy a book about something, that it’ll recommend something that’s related to that. Adam: How would you imagine a very, very large financial institution, let’s take the big five, where do you see the value to them in an open banking world? You know: “people like you that have this kind of financial profile, find products like this useful”, and a curated offer that actually might get me thinking about some of those things in a useful way. So, I think there are lots of opportunities for the big banks to actually have a better understanding of the customers and then be more relevant and more helpful to them. You have to start with a mindset of trying to help the customers, and then think about making sure you’re not pre-assuming certain things about their needs in a very complicated world. Adam: Anytime you solve a very complicated problem, you need to start with a first step. What do you think is the baby step into embracing that kind of mindset shift? Andrew: The first thing is to allow people to be able to consolidate all their financial data in one spot. So, data aggregation, it’s probably become something of a commodity. Once you’ve got data aggregation in place, so then you can actually start to try and provide insights and you’ll learn whether the insights are relevant or not, depending on how people react to those insights. You’ll learn by communicating with the people that created the data. I think open banking has to go way beyond aggregation. It’s got to get to the point where we can actually trigger payments from a central spot. From my perspective, I’d much rather go into a single place, see all of my financial affairs, get hints about where how I could optimize the outcomes for me and then move money into the right spot. And I wouldn’t have to go into other service providers, and have to remember all sorts of passwords to move money. It’s gotta be something I can do in five minutes, and know that if I do it once a month I’m managing things fairly well. That’s what I would be trying to achieve with an open banking environment. And then I can do something more interesting, like go ride my bike. Adam: I think that’s an amazing note to leave it off on. Andrew, thank you so much. Really appreciate the time. This is it for the first episode of Connect. Let us know how we did in the comments below. Don’t miss out on new episodes! Subscribe to our newsletter.